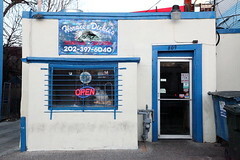 Only a modest blue logo marks the door of Toki Underground, which despite the name sits above a bar, up a narrow, steep flight of stairs. Long waits and a full house are, reportedly, not uncommon at this tiny ramen-ya, and seating is snug. I was squeezed in at the slender counter along one side wall, and only on withdrawing, after my meal, did I see that the footrests underneath are a series of skateboard decks. Between the passing bodies of incoming diners I saw that other decks, brightly colored and split lengthwise, form the balustrade where the stairs rise to the second floor. Which is to say that there's little opportunity to check out the decor, or the crowd, or — unless you land one of the prized seats surrounding the open kitchen — even to see who's ordering what. I caught a look only at the dishes to my immediate left and right. Just as well: My own bowl arrived in very short order. The Toki classic ($11), which employs a tonkotsu, or "pork bone," broth, is dressed with red pickled ginger, sesame, scallions, and nori. More-substantive ingredients include straight, thin noodles, chasu pulled pork, a soft egg, and seasonal vegetables — this day, dark green bitter rolls of Chinese mustard greens. 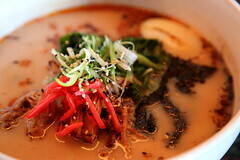 Tonkotsu ramen is especially associated with the Hakata ward of Fukuoka, on the southern Japanese island of Kyushu, and under the name "Hakata ramen" is regarded as a major regional variation. Toki's chef was born in Taiwan, and his dishes were "inspired" (says the menu) by his "experience at a Hakata ramen shop in Taipei," so his dishes have elsewhere been described as a fusion of Japanese and Taiwanese influences. This particular ramen has been dubbed "Hakata style," but I'm not enough of a ramen aficionado to point out the distinctions. I am enough of an aficionado to drain my bowl. 1234 H St. N.E. (12th-13th Sts. ), Washington, D.C. The dark red dollop of nam prik narohk, literally "chili paste from hell," is one of a family of Thai condiments with various consistencies and temperaments. 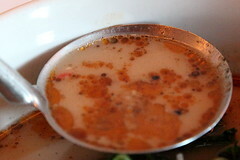 At Little Serow this particular nam prik was prepared from catfish, tamarind, and chilies; ultimately, it wasn't so hellish. 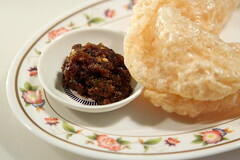 Alongside is khaep muu, introduced by my server as housemade Thai "chicharrones." 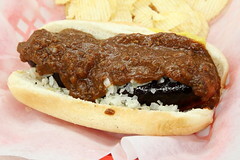 Ben's rendition of the chili half-smoke ($5.70), featuring a coarsely ground quarter-pound sausage, equal parts beef and pork, is the most celebrated in the District. But what the hell is a half-smoke? There's no one firm definition. Neither is there consensus on how to eat one without dribbling chili in all the wrong places. Some rely on knife and fork. Others may heed an instructional essay by George Washington University's Bernard Demczuk; "Bernie's Dog Bite Method" proceeds in five steps, from positioning, to grip, to lift, to entry, to bite. Dr. Demczuk kindly inscribed a copy for me, but my half-smoke was already at hand, and so I had to rely on my own years of training. 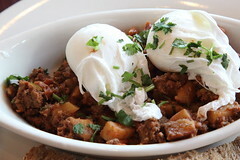 If I was going to drip chili, I'd drip it onto those potato chips. 1213 U St. N.W. (12th-13th Sts. ), Washington, D.C.
1025 5th St. N.W. (K-L Sts. 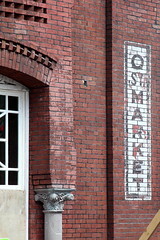 ), Washington, D.C.
With the Eastern Market and the Georgetown Market, this 1881 Victorian structure is one of three 19th century public markets in the District. It joined the National Registry of Historic Places in 1995; by late 2013, apartments are expected to be available at a made-over City Market at O. Surviving signage at 1400 7th St. N.W. (at O St.), Washington, D.C.
Named for an Algonquian word meaning "let's eat," this cafeteria features Native American-inspired cuisine at five stations representing the Northern Woodlands, Great Plains, Northwest Coast, Meso America, and South America. Shown are pickled acorn squash with sea beans, cherry braised red cabbage, and roasted sweet potatoes with birch bark syrup and pine nut dust. I've decided I prefer my acorn squash unpickled, but also to keep my eyes peeled for local birch-syrup purveyors. After the manner of all too many stereotyped TV Westerns, you can mingle several Native American traditions on your plate, willy-nilly. My trio all hailed from the Northwest, though I couldn't resist a few forkfuls, off a neighboring plate, of chestnut whipped potatoes from the Woodlands, too. Also shown, from a return visit to the Northern Woodlands: maple pudding fringed with a few crisp bits around its moist, dark heart. 4th St. and Independence Ave. S.W., Washington, D.C. 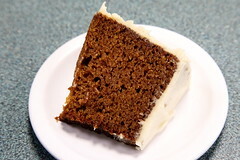 Carrot cake deficient in beta-carotene? No — this very smooth-textured slice, not dry or crumbly in the least as carrot can sometimes be, was made with sweet potato ($2.85). The cake was "birthed" at Torrie's some 30 years ago, said the chef on emerging from the kitchen; a decade later, the baker went his own way, but he still provides sweet potato cakes for this restaurant, as well as others. Torrie's goes through about 20 of these cakes per week, added the counterman. 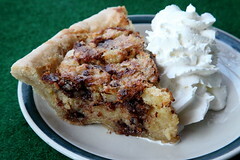 It took me five minutes to go through a slice, but only because I forced myself, several times, to set down my fork. 700 V St. N.W. (at Georgia Ave.), Washington, D.C. 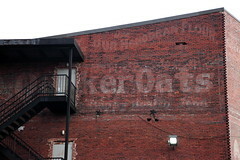 In the first photo, the wavy overline that reads "our monogram flour" probably belongs to a sign of another vintage. 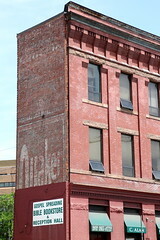 That side of the building now faces an alley; doorways and a fire escape are more-recent additions. The second photo shows the vantage from the avenue. Surviving signage at 2002 Georgia Ave. N.W. 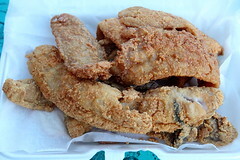 (at Florida Ave.), Washington, D.C.
Two slices of white bread, fast becoming soggy in the steamy confines of the takeout container, hid beneath a heap of whiting filets. Assembling a single giant fish sandwich ($6) would have been folly; I put away a pair of smaller sandwiches, folding each slice around its own filet, and ate the rest out of hand. At lunchtime on Friday the line at Horace & Dickie's is often long; on Good Friday, the occasion of my first visit, I arrived at 10:30 in the morning and still waited just under an hour. The relatively quiet midafternoon, when I snapped the second photo, is a better bet. 809 12th St. N.E. 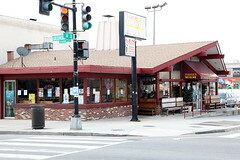 (H St.-Wylie Ct.), Washington, D.C. The Baltimore Bomb (slice with whipped cream, $6.50) celebrates the Charm City's storied Berger cookies. These mounds of fudge frosting atop shortbread are hand-dipped, and notoriously irregular in appearance; melting the cookies and swirling them into a vanilla chess filling barely counts as deconstruction. One quibble: The crusts are made en masse for all the shop's pies, sweet and savory, vegan and not. This one wanted more pliability or less tensile strength. 1339 H St. N.E. (14th St.-Linden Ct.), Washington, D.C.